The black-capped chickadee is Massachusetts’ state bird. Their familiar “chick-a-dee-dee” call is full of information about possible threats to their safety. Other chickadees understand the details and respond accordingly. Whether you’re venturing outside or watching the birdfeeder through a window, a flock of vocal and acrobatic black-capped chickadees – our Massachusetts state bird – probably keeps you company on these cold February days. How does chickadee speech work? The “chick-a-dee-dee” call is a scolding call that often warns flock-mates of a predator that’s perching or lurking nearby. But the call doesn’t simply mean “Watch out!” A chickadee adjusts the number of “dees” in its call to send out information about the size of the predator and how much of a threat it poses. For example, big creatures like humans and great-horned owls would have trouble catching a small, quick, maneuverable chickadee, so they rate about two “dees”. Smaller, more nimble predators, such as screech owls, sharp-shinned hawks, cats, and weasels, might get three or four “dees”. Chickadees that hear these calls respond accordingly. With a less dangerous predator, such as a human, they fly over for a good look. They act aggressively toward a more threatening predator, flying toward it and ganging up to drive it away by attacking and harassing it. The more dangerous the predator, the more energetic and longer-lasting their “mobbing” behavior is likely to be. If a predator is flying overhead or rushing toward them, chickadees give an urgent alarm call that we humans are less likely to notice – a short, high-pitched “zee” call. Other chickadees freeze in response, making themselves harder to spot. The chickadee warnings help to keep a flock safe. Different flocks have their own variation of the “chick-a-dee” call, and chickadees that join a flock adjust their own call to match the flock’s call. The small winter flocks of chickadees that we see today formed late last summer and will last into early spring. A winter flock typically forms around a pair of chickadees that bred in the local area in the past season. The other members are usually unrelated younger birds. Chickadees don’t usually migrate, so the flock sets itself up in a winter territory of about 20 acres with good places to feed and sheltered places to roost at night. The flock and the territory help these birds survive the winter. Can you tell “who’s who” in flock? It’s hard to keep track of individual chickadees because all of them – males and females, young and old – look pretty much alike. By watching the activity at a birdfeeder, you might notice signs of a dominance hierarchy. One chickadee might make a move toward another to drive it farther away, or one might get out of the way and appear to defer to another. Scientists study flock hierarchies by putting differently colored bands on the birds and making “pecking order” charts. 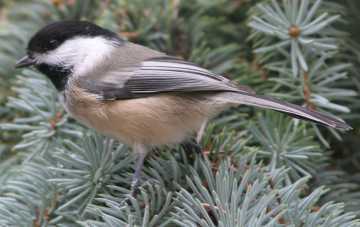 Chickadee flocks are so advantageous that other insect-eating birds join them. You may have noticed a flock with one or two white-breasted nuthatches, titmice or downy woodpeckers, but kinglets and brown creepers also sometimes travel with chickadees. In fall and spring, when birds are generally on the move, migrating warblers and additional chickadees may also join. If you stop filling a birdfeeder, what happens to the flock of chickadees that comes to it everyday in winter? Fortunately, like most birds, chickadees seek out many sources of food. They eat insects year-round. Even in winter, chickadees find enough insects, spiders, insect eggs, and dormant larvae in tree bark to make up half their diet. The other half is seeds and berries. At most, chickadees get only 20-25 percent of their daily calories from sunflower seeds. When it comes to seeds, chickadees don’t leave their supply to chance. They’re smart enough to store some of the seeds they find when natural supplies are abundant in the fall. They hide them one by one in different places – cracks in bark, knotholes, and clusters of pine needles – and return to eat them later. The chickadee that you see flying away from the feeder with a fat sunflower seed may be taking it off to hide. Do chickadees actually remember where they hide seeds? The answer is yes. They have very good spatial memories. Scientists found that brain-damaged chickadees could hide seeds as usual but weren’t able to find them again. How do chickadees do it? In the fall, when it’s time to store seeds and remember their hiding places, the brains of chickadees grow by almost 30 percent. They actually add new brain cells to the part of the brain involved in spatial memory. They also allow old brain cells with outdated information to die, helping to make room for new ones that store new information. In the spring, when insects – especially caterpillars – become plentiful, the part of the brain involved in spatial memory shrinks. Chickadees also have a surprising energy-saving trick that helps them survive very cold winter nights. At times when they might not have enough body fat to burn to stay warm, they can allow their body temperature to drop by almost 20 degrees F. They become sluggish but can fly in an emergency. But that’s enough about winter. In the months ahead, listen for a sure sign of spring: the chickadees’ “fee-bee” or “hey sweetie” song that heralds the start of their breeding season.